Boynton Billiards is a family owned and operated business since 1990, started by the late John Corvey and his wife Debbie Corvey. Debbie is still very active in the business helped by 2nd generation son Larry Wood. Vice President Larry Wood, who is in charge of on-line marketing, stresses the value of the on- line presence to keep up with today’s world. Builder and designer assistance is handled by Director of Sales, Michael Ruback, a long time professional in the design trade industry. Delivery and service crews are led by long term employee Jeremy Brooks, assisted by Tony Vierra and an in house service coordinator Gabriela Etchegaray. All employees are dedicated to the community to deliver professional service along with quality products. Founder and President of Boynton Billiards has designed game rooms all over the country. Debbie currently sits on the Billiard Advisory Board for Olhausen Billiards in TN. In the past, she has advised many billiard manufacturers about current styles and trends. Her dedication to quality furniture with decorator styling has made her a leading authority on game room design. Michael Ruback is Director of Sales /Vice President of Boynton Billiards, with responsibilities of following up on leads from internet inquiries to architects, as well as designers, builders and multi-unit dwellings. Prior to joining Boynton Billiards, Michael was a manufacturer’s representative for the Billiard Industry and has been in the business for more than 25 years. Michael’s greatest strengths are his creativity, drive, and urgency to follow through to close sales. He thrives on challenges for each and every client to make sure he is delivering the best quality products as well as customer service. Michael is well-respected from Presidents and CEO’S in the Billiard Industry and beyond. Michael graduated from Dwight Morrow High School in Englewood, New Jersey and then went on to attend college at Jacksonville University. He lives in Orlando with his wife and daughter which enables him to be mobile with our clients throughout Central and Northern Florida. 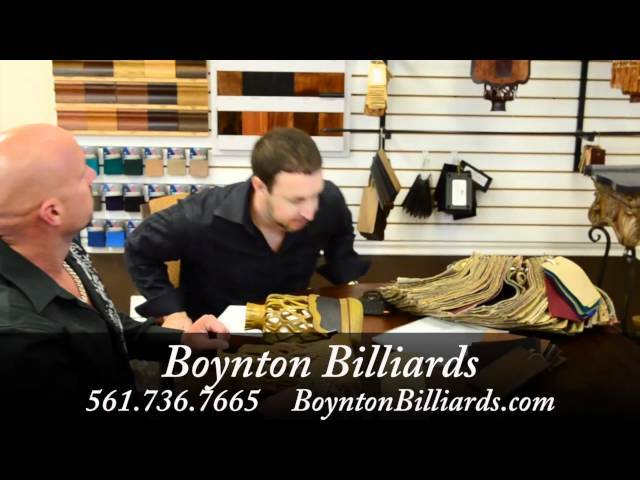 Larry Wood is a managing Partner at Boynton Billiards. Larry is a South Florida native who studied Business and Marketing at Santa Fe College in Gainesville Florida. Online marketing has been Larry’s strong point for the last 15 years. He believes that the online market place gives Boynton Billiards a huge footprint in the billiard industry. – Area expert on new & antique billiard cues and billiard related items. – Provides game room design and space planning. – Works with manufactures on new designs & styles for the billiard industry. – Works with trade designers.